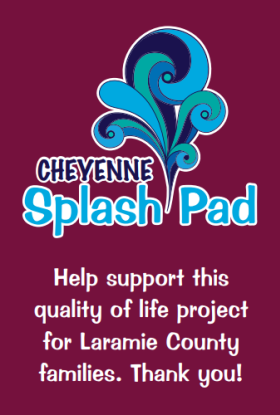 The City of Cheyenne and interested partners intend to build a water feature /splash pad on the Depot Plaza in downtown Cheyenne. It will be similar to splash pads in downtown Fort Collins and Rapid City where jets of water shoot from the ground, and kids can run through them. The water feature will operate when the weather/temperatures allow it to be operational. The water feature will include a recycling pump so the water will be appropriately filtered and reused. For more information, check out our pledge form.